Catalog Listings > Opalescent Gaia Star Brazilian Rose Quartz Freeform – Double Star! 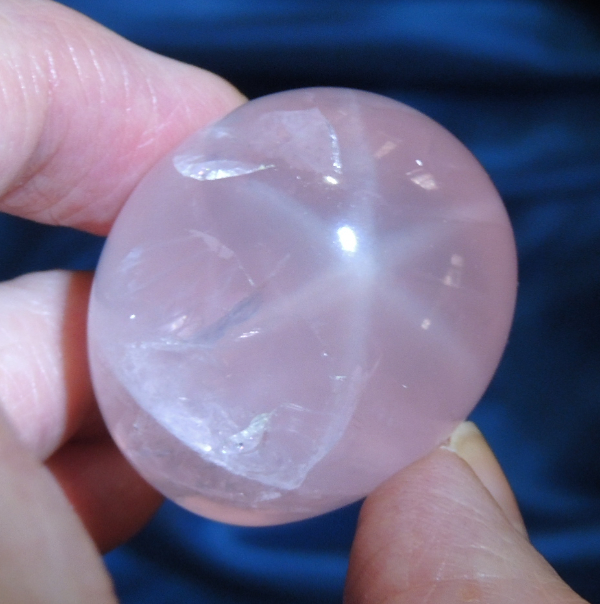 This is a deliciously opalescent, 1.5 oz, star rose quartz somewhat egg-shaped freeform, 1.5" in height and 1.1” in diameter, from Brazil. Now, most of the star rose quartz is coming from Madagascar, but the Brazilian sources, becoming rare, have superior color and energy … and when you see the luscious color on this beauty, you’ll be converted to Brazil forever! She is a lovely, silky-looking, opalescent rose with cloud-accented rainbow area on one end that invites you in immediately to get lost in that pink fog! In the crystalline realm, there are several mineral species that demonstrate asterism; sapphires, spinels and rubies are all well known. Included nano-fibers (these are very, very, very tiny iron-titanium fibers which are also rose colored … email me if you’d like additional information) catch the light and give a characteristic asterisk-shaped star … and she has two of them – one in the misted area and the other in the more clear area. As a note, I used a LED light to catch the stars and that gives her a bluish pink color. Her true color is represented in the ones taken in regular daylight. She is a wonderful size and perfect for your loving meditations! There is a very slight rough spot in one area, but nothing that detracts in any way from her beauty or energy. This Spirit has a nice hand feel and soft and compassionate energies, like all rose quartzes, but with a somewhat more soothing energy. The iron-titanium fibers give her the feel of an angel's heart. I love watching her stars appear and disappear magically, as you turn her in the light! She wants to near her Keeper, even being placed under the pillow at night to banish nightmares and encourage happy, ebullient dreams. She also helps you understand the true nature of love, beginning with the healthy love of self. When dealing with any relationship, it is imperative to first love yourself so that you can truly open to another. And if that weren't enough, she is just stunning to look at! As I said, she is superior for scrying and getting to the ‘heart’ of the matter! Opalescent Gaia Star Brazilian Rose Quartz Freeform – Double Star!